Sunshine Kelly | Beauty . Fashion . Lifestyle . Travel . Fitness: Which Colour Of Flowers Is Best For A Friendship Bouquet? Which Colour Of Flowers Is Best For A Friendship Bouquet? We all have a close friend who means the world to us so what better way to honour them then with a beautiful and uplifting bouquet of flowers? Flowers can be given to a friend for a variety of different reasons, whether it is a way to cheer them up or just to remind them how important they are to you. However, there are certain species and colours of flowers that might not be considered appropriate to give to friends. Here are a few tips on choosing the best friendship bouquet. Roses are widely considered the flower of love and devotion. However, the colour of the rose you choose for your friendship bouquet is very important. Red roses, for example, are meant to represent true love on the romantic scale. Unless your intention is to let your friend know that you would like to be more than just friends, red roses can be an inappropriate and confusing choice. If you know that your friend is a fan of red roses, try incorporating them into a bouquet with other species of red flowers or use them as a tasteful accent to a white or pale coloured bouquet. White and yellow roses, on the other hand, are great roses to give in a friendship bouquet. Both of these colours are vibrant and can represent friendship, whilst making a truly beautiful bouquet. 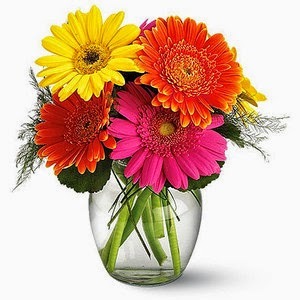 You can shop for a selection of flowers and send the perfect bouquet to your friend. When it comes to a friendship bouquet, the more neutral the colour scheme, the better. Shades of white and pastels are perfect for creating a fresh and soothing feel to the bouquet without looking to romantic or intimate. White lilies or calla lilies are a neutral yet stunning option because they can pull off bouquets with only a few floral accents or even none at all. Daisies and white hydrangeas are also excellent for a friendship bouquet because they both can easily stand alone to create a simple but stunning look. When creating any bouquet, adding a touch of green is pretty standard. A beautiful bouquet of white roses or calla lilies can look stunning with the addition of some fern or green leaves to make the flowers really stand out. Adding a little green to the bouquet can expertly accent any species or colour of flower and it gives it a more rustic feel. Another option is to create a green bouquet. Normally when we think of flowers, we envision bright, bold colour or soft pastel tones. Very rarely do we consider green to be a floral colour. However, many species of flowers come in a variety of different shades of green and believe it or not, they make absolutely stunning bouquets. Tulips, for example, come in nearly every colour of the rainbow. Green tulips can easily be the foundation for an attractive and unique style of bouquet. Not a fan of tulips but a huge fan of the green bouquet concept? Try starting with some chrysanthemum shamrock or green aster and have it emphasized with pale green amaryllis or white gladiolus to present your friend with a truly unique and sophisticated bouquet that they will truly appreciate. If you are familiar with the inside of your friend's home, then you have an excellent advantage when it comes to choosing a bouquet that they can really enjoy. Bouquets are generally placed on the table in the dining area so this is the room you should focus on. You don't have to necessarily match the room colour for colour though. Try choosing a bouquet colour scheme that will stand out without taking away from the rest of the room. If your friend’s colour scheme is primarily white then the sky’s the limit! You don’t need a reason to send a bouquet to a friend. However, if you’re looking for an excuse, then why not consider sending them for a birthday, the anniversary of a date that means something to them, to congratulate them, or if they’re a mother to celebrate Mother’s Day. Letting your friend know that you think they’re doing a great job with the kids is a very welcome gesture indeed, and with Mother’s Day coming up soon, there’s no time like the present. It’s a great idea and a kind gesture she’ll really appreciate.